Members of the 13th Greater Dayton Legends of the Game are, from left to right: George Flake of Beavercreek; Curt Roach of DeGraff; Tracy Hall of Medway; Bob Kender of Dayton; Donnie Brewer of Dayton; Mike George of Bellbrook; and recognized sponsor Dr. John Urse, Orthopedic Associates. 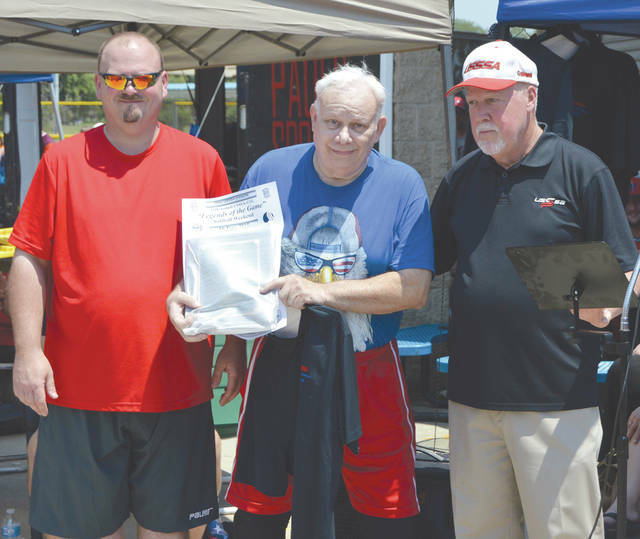 George Flake (center), of Beavercreek, is presented with a plaque and the official USSSA Legends of the Game shirt from tournament co-director Eric Walters and Scott Kuhnen of Dayton USSSA, during a recognition ceremony, June 16 at Kettering Field in Dayton. 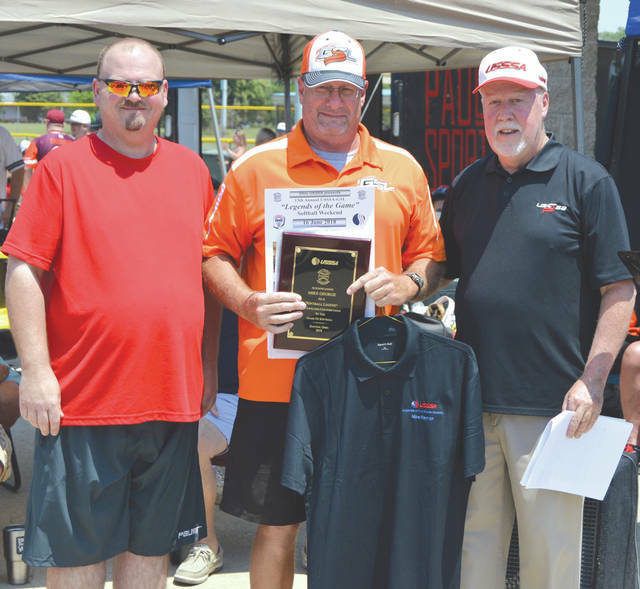 Bellbrook’s Mike George (center) accepts his plaque and USSSA Legends of the Game shirt from co-tournament director Eric Walters (left) and Scott Kuhnen from Dayton USSSA, June 16 at Dayton’s Kettering Field. Past Legends of the Game stars were also recognized during Saturday’s June 16 ceremonies at Kettering Field in Dayton. 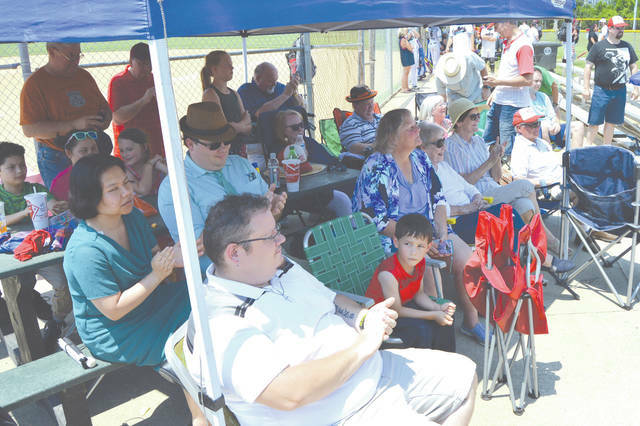 The Fairborn Church League and St. Mark’s Episcopal Church softball team members turned out to watch league commissioner, former player and coach Tracy Hall get recognized as Legend of the Game, June 16 at Kettering Field in Dayton. 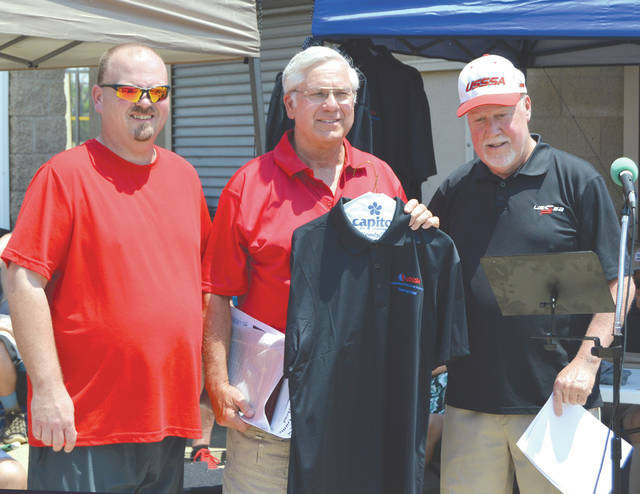 Fairborn Church League founder Tracy Hall (center) poses with tournament co-director Eric Walters (left) and Dayton USSSA’s Scott Kuhnen, during Legends of the Game ceremonies June 16 at Dayton’s Kettering Field. DAYTON — For Beavercreek’s George Flake, Bellbrook’s Mike George and Fairborn Church League founder Tracy Hall, of Medway, the three men had spent years either playing the game they so loved, officiating the games, or organizing them from behind the scenes. 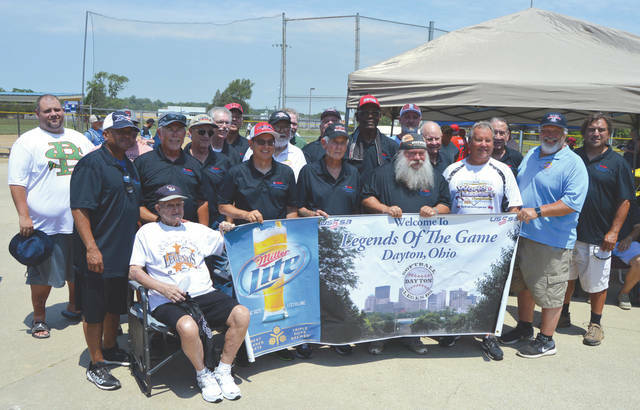 During the annual Legends of the Game softball tournament at Kettering Field, the three area softball influences were recognized along with four others as the 13th class of Legends of the Game. Flake, Hall and George were recognized along with Curt Roach of DeGraff, Bob Kender and Donnie Brewer of Dayton, and longtime sponsor Dr. John Urse of Orthopedic Associates as the 2018 class of softball legends. That brings the total up to 77 Legends who have been recognized for their efforts. The inaugural class was recognized in 2006. Each of the local legends appeared to be humbled by the recognition. Flake appeared flattered that his peers would recognize him for all the tireless nights he spent organizing area softball tournaments behind the scenes. Flake said it wasn’t until this past year that he started to step away from the scheduling part of the game. Hall had fans and admirers on hand from his hometown of Medway, from the St. Mark’s Episcopal softball team of which he was a former player and now a coach, and from the Fairborn Church Leagues that he helped to form. They erected a small shade tent behind the Diamond 19 backstop to witness the Legends of the Game festivities in relative shady comfort. “For years, I’d meet these guys from the Dayton Legends Softball Club, and they’d assume I already was a Legends of the Game inductee,” laughed Hall. “I do it because I love it. Tuesdays and Thursday nights, I’m out at the Fairfield Park. if I had a hobby, other than the motorcycle riding with my wife Barb, this is it. Scott Kuhnen of the Dayton chapter of the United States Specialty Sports Association served as emcee for the event. 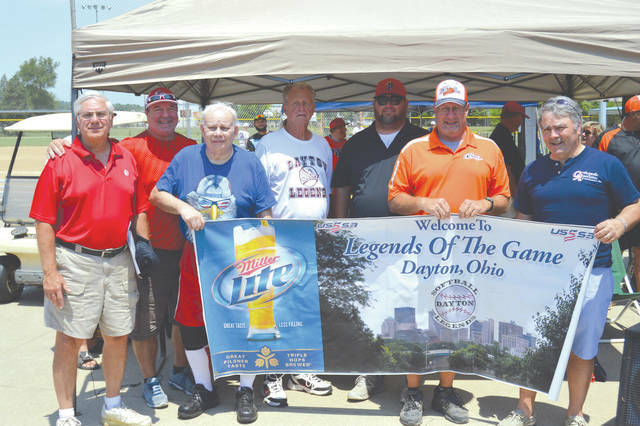 He and co-tournament director Eric Walters presented each Legends recipient with a plaque, a laminated program commemorating the event, and an exclusive Dayton Legends Softball Club polo shirt, which is only given to Legends members. Choked up with tears, Kuhnen explained that he and other area softball officials wanted to find a way to recognize Southwest Ohio’s best in amateur softball. The USSSA Dayton chapter had previously only had a Memorial tournament, which recognized softball standouts who had passed away. Kuhnen recalled a fellow USSSA official saying “it was a shame that a person had to be dead in order to be recognized by this game,” and he set about creating a tournament that would recognize the area’s best when they were still around to enjoy it. Saturday’s event was the 13th Legends of the Game recognition ceremony. There have been 77 area softball personalities recognized thus far. Eleven of that number have since passed away.